A big bag of fresh-picked apples is sitting on my kitchen counter. And I mean a BIG bag. If we had a bushel basket, it would be full to overflowing. What kind did you pick?, I asked my daughter. Oh, lots, she replied. Jonagold, Northern Spy, Empire, some other kinds. It’ll be a surprise, every time you take one. Wonderful! I said, I just found this great recipe for apple butter. You do it in the crock pot. Why would you make apple butter, when you can make pie? said the baker. She is talented in the crust-from-scratch department. However, judging by our supply, there’ll be plenty left for apple butter once we’re fully sated on apple pie. And probably more left over for applesauce, caramel apples, apple crumble, for apples in our salads and grated into cole slaw, baked whole or with pork chops… or for enjoying with a chunk of aged cheddar while they’re still from-the-tree juicy and crisp. Love apples, too? You might find this Foodland Ontario apple link handy, with info about creating and freezing your own apple surplus, plus a long list of recipes to ring in the changes, in time for Thanksgiving. I have a feeling we’ll be trying… several. I went to a cider mill yesterday. I confess I like my apples mashed into cider versus intact. BTW, we should be in the same zone and beautyberries should do fine there. I am jealous! 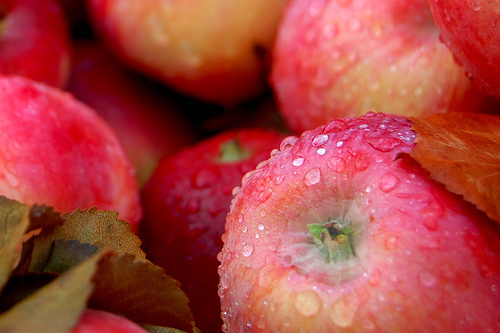 When we lived in Missouri, we used to pick up apples, ourselves, in local orchards. Here in Washington state, we haven't found such a place that would allow people to do that. The picture looks very, very yummy! Like you I have a big basket full of many types of apples. I've never been a fan of apple butter. You know how you've never seen something, then it comes up twice in two days. First I wondered why there was a Spy in the apple pie. Now I know! Growing up in Niagara, fruit picking was not only a great job when you are a teenager, but I always found it a lot of fun as well. Apple butter in a crock pot sounds like a great idea. I like what I can make with apples. Love crisps and pies, yum. Being from Pennsylvania, I grew up having apple butter on everything. Yum again. Thanks, everyone, for dropping by. It doesn't matter how many ways I use them, I never seem to tire of apples. Just used some to add sweet-tartness to my curried butternut squash soup. I have to confess that I, myself, have never actually gone apple-picking. The crockpot apple butter turned out well — despite the fact that, with my cold-fogged brain, I used nearly twice the sugar the recipe called for. It's now more like apple jam. But the kids give it the thumbs up. I'd try it again.